All the world may be a stage, but at the New Burbage Theatre Festival, it's backstage that's a world of intrigue, sly comedy and complicated relationships. The three seasons of this brilliant Canadian comedy-drama revealed the tensions, egos and feats of diplomacy that go into keeping together a Shakespearean theater troupe (loosely based on the Stratford Shakespeare Festival) beset by artistic conflicts and financial tensions. A brilliant but difficult director (Paul Gross) tries to pursue his theatrical vision while dealing with the demands of adminstrators and actors, the legacies of past relationships and his own self-doubt. 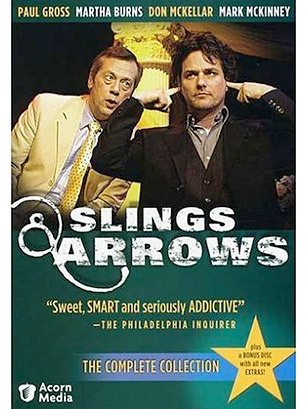 Acutely observed and subtly funny, Slings and Arrows is one of the best behind-the-curtain TV series we've had the outrageous good fortune to see.